Senior midfielder Shoshana Bedrosian dribbles the ball down the field against Wilkes University on Sept. 5. 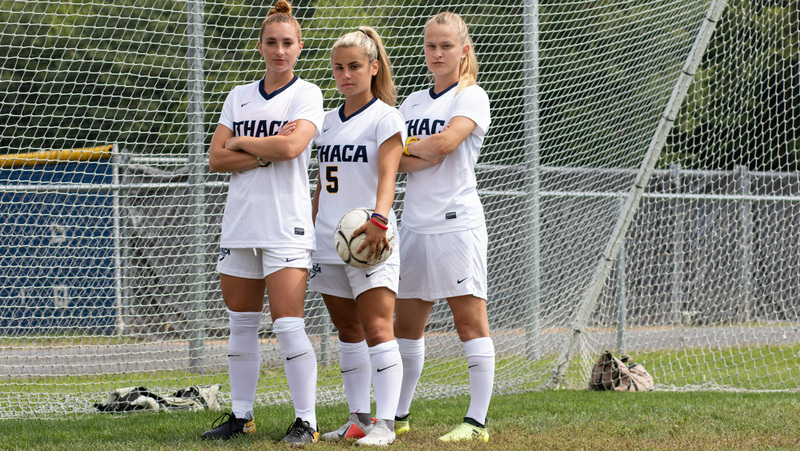 During their home opener against Wilkes University on Sept. 5, senior midfielder Shoshana Bedrosian received a pass from junior forward Ally Christman and drilled home her fifth goal of the season for the Ithaca College women’s soccer team. Bedrosian has now scored every goal for the Blue and Gold in every game she has competed in during the 2018 season. The South Hill squad is currently 4–0 this season with critical wins against Centenary University, Westfield State University and Wilkes University. Bedrosian did not compete in the team’s Sept. 8 game against Elmira, which it won 9–0. Bedrosian has not always been the clear star for the Bombers. During her freshman and sophomore years, she tallied only six total goals. She earned her status as a consistent starter in her junior year, but her breakthrough in performance truly began in the middle of the 2017 season. Bedrosian notched four goals against Wells College on Sept. 16, tying the school record for the most goals in a single game. This year, she has upped her momentum even more, netting three goals in the season opener for a 3–1 win over Centenary on Aug. 31. As the week continued, she added one apiece in two shutouts versus Westfield on Sept. 1 and Wilkes on Sept. 5. Bedrosian attributes manyl of her accomplishments over her college career to her teammates and the college’s coaching staff, naming them as the greatest factor in her growth as an athlete. Bedrosian’s real transformation has been a physical one. Measuring only 5’3”, Bedrosian is small compared to the average collegiate soccer player. Fellow senior forward Sarah Pirnie said she laughs now thinking back to how Bedrosian was four years ago. Building up her strength and using her size to her advantage have become critical in her development as a star for the Bombers. Though she gives much of the credit to the people around her, Bedrosian said she takes some ownership of her success due to her work ethic. Bedrosian puts a lot of time into her offseason training. She puts in time every day, training through a variety of mediums. She includes a mix of on-ball work to improve her technical skills, off-ball agility training, cardio workouts and weight lifting in order to achieve well-rounded fitness. Bedrosian said she takes a great deal of pride in continuing the legacy of the women’s soccer program. She also emphasizes the importance she places on continuing to learn more about the sport, even though she has been playing since she was only 4 years old. Head coach Mindy Quigg said she believes Bedrosian’s willingness to learn and grow is what has allowed her to develop into the leading scorer she is today. Above all, the senior’s all-or-nothing mentality towards her final year competing is driving her towards big things in the rest of the season to come.